With decades of experience in assisting companies, organisations, and domestic projects to complete their work on time and to budget, you can be assured that you are in the safest hands when you choose ND Brown for your grab hire in London. Our aim is to facilitate your operations with a grab hire service in London which meets your needs in terms of quality equipment and flexible contracts, as well as presenting you with excellent value for money. The support we offer doesn’t end when your hired equipment gets to you – we are only a phone call or email away should you need us at any stage! London is a city in constant motion; not only is the city a bustling hive of activity, the cityscape is also constantly changing as innovators and investors are attracted to opportunities in the area. We specialise in providing HGV and grab hire in London and the surrounding areas, and have a well-stocked depot nearby; perfectly placed to supply our vehicles to your sites in London. As well as grabs, we provide hot boxes, tippers, cage tippers, and more. All of our vehicles are maintained to a high degree to ensure reliability – we understand that a lot of potential setbacks can occur onsite, but you will never be let down by your ND Brown grab hire in London. 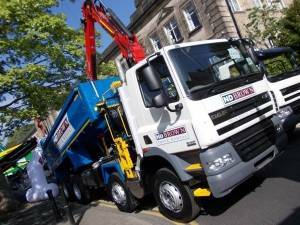 This goes for all of our fleet of HGVs and working vehicles; you can take a look at all the vehicles we supply through our hire service, and the vehicles which we have for sale. Contracts are available with an open end date, offering you ultimate flexibility. Using our service for grab hire in London couldn’t be simpler – if you know what you need, fill in our booking request form and we will get in touch with you. If you need a little help, just get in touch with us.